These days people find it difficult to find time to give their dog the exercise they need. This could be due to working hours or a busy lifestyle. One of the keys to having a happy, balanced dog is the daily interesting, physically and mentally stimulating walk that your dog needs and deserves. This is the perfect combination to ensure you have a happy dog at home. Tired dog = happy owner! Your dog will be collected from its home and transported in a secure and air conditioned vehicle to an ideal walking location. 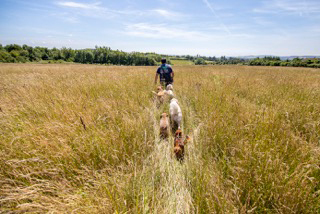 Exeter has lots of exciting places to walk a dog, or a small pack. The safety of your dog is paramount so we only walk in areas away from busy roads. We will only walk a small pack, a maximum of six dogs, so your dog can have our full attention. When dogs walk as a pack, it develops and improves many of their social skills and makes them feel like they are doing a job. It keeps their minds active and therefore, at the end of it, they feel tired and relaxed for the rest of the day. Dogs will only be let off the lead with your permission and if they have good recall. After our walk your dog will be returned to your home tired and happy. We will dry their wet and muddy paws, making sure water is available before leaving them. 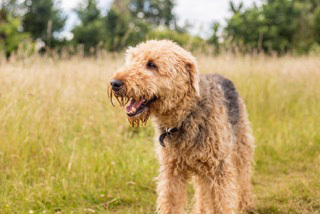 Our dog walking service is totally flexible, so whether you need a daily walk or just the odd day every now and then we are happy to help.We can sometimes accommodate walks at short notice. Amigo pet services has the “ will do” attitude and there are no problems just solutions! Before any walk takes place, there will be a free initial consultation to talk about your dog and of course to meet each other, this is your perfect opportunity to ask any questions you may have. All dogs must be fully vaccinated and wear a collar and tag with contact details. Our dog walking is one of our most popular services.